We can only save lives and improve the quality of life of everyone affected by bowel cancer with your support. You can help raise awareness and spread the word this Bowel Cancer Awareness Month. Give us your details in the form below and we’ll send you five posters for free to put up in your community. That could be your local GP surgery, library, community centre, place of work, hospital, supermarket or newsagent for example. Every 15 minutes in the UK somebody is diagnosed with bowel cancer. Young, old, female or male – it affects us all. 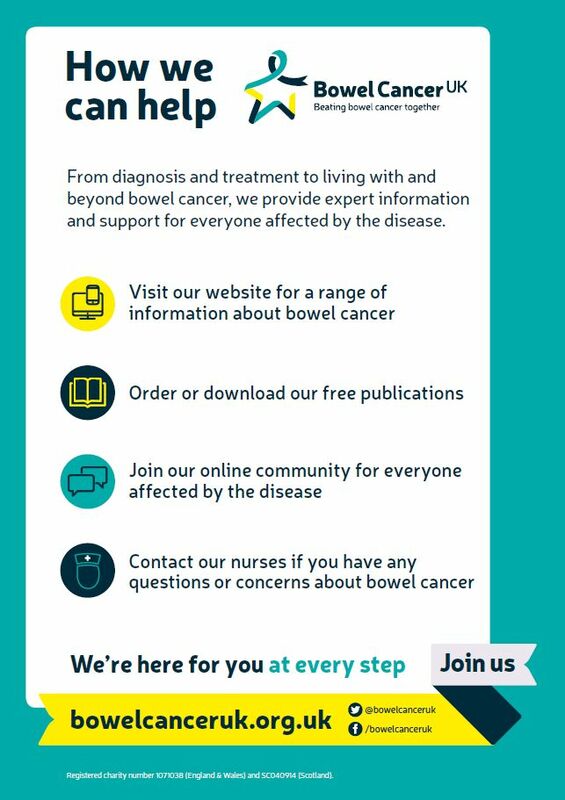 By raising awareness of bowel cancer and how we can support people, you’ll help ensure more people affected by the disease get the support and information they need. Want more than five copies? Download and print our poster. Poster orders close Friday 26 April. We would like to keep you updated about our latest news, campaigns and ways you can support us. Please only click submit once and wait for the form to be submitted. Clicking multiple times can cause multiple registrations to be recorded.